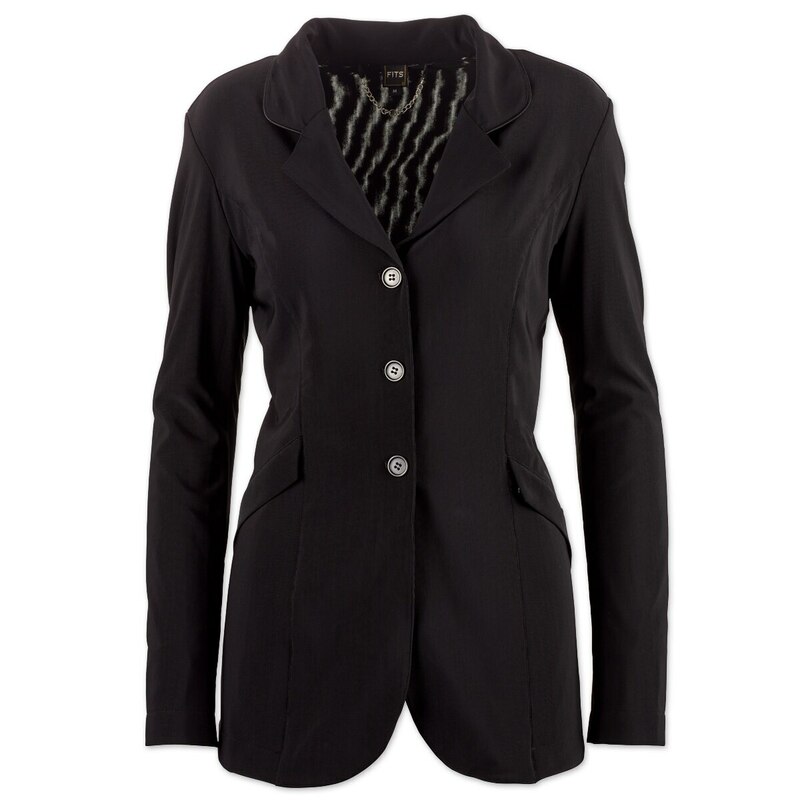 Stand out in the show ring with the FITS Zephyr II Hunt Coat no matter what the temperature is! The Zephyr II Hunt Coat is made from all mesh, providing maximum airflow and sweat evaporation. With varying layers of mesh in different areas, the coat provides breathability without being transparent. FITS Zephyr II Hunt Coat is rated 4.0 out of 5 by 5. Rated 5 out of 5 by IOhunter from Summer Must Have As someone who is sensitive to heat, I am constantly searching for clothes that keep me cool during the hot, humid summer months. I was not disappointed! I was worried the jacket would seem cheap, but the jacket is completely opaque as promised. While it isn't the most beautiful hunt coat, it's a lifesaver in 90+ degree heat. The sleeves were rather long and I had to tuck them before getting them taken in. Rated 5 out of 5 by JoPazStevens from I love it! I really like this jacket, it is very light weight and cool. I appreciate that it is simple and classic. I wear an 8/medium in everything and I ordered a small based on other reviews but had to return for a medium. Rated 4 out of 5 by Beezy from So cool! Have to agree with other reviewer that this jacket has a very basic look, but it's wonderful if you're wanting a jacket for hot weather. Soooo light & breathable with great stretch - just what I was looking for! I tried several other "breathable" brands that did look nice but just weren't cool enough. Rated 2 out of 5 by kathy from Odd fit I was very excited to get a coat that I might not sweat terribly in for summer shows. This coat unfortunately went back. I liked the material and style. It seemed like it would be cooler for sure. The shoulder and chest area fit perfect (I'm sz 10 and I ordered the medium). The strange part is the bottom of the coat is too full and looks like a dress at the bottom. It did not fit like any show coat I have ever had or tired on. The sleeves were also very long and would have needed to be shortened significantly. Rated 4 out of 5 by cbg1 from Ugly But Oh So Cool... So I think this jacket is pretty ugly, but I can't stop wearing it. It is, in fact, not truly ugly, it's just a plain, basic, boring blue coat. But it is so lightweight and so much more comfortable on a hot summer day than any other show coat I have. I wish that it was a little snazzier, but I also tried the regular FITS Zephyr coat (black with the silver zippers, silver buttons and silver trim around the collar) and that was a little too much going on. As for sizing, I ordered both versions of the FITS Zephyr coat in a medium (size 8 - 10) which is what I always wear. The black/silver jacket in medium was gigantic and the blue jacket in medium was also too big, but not gigantic. So I ordered both coats in a small (size 4 - 6). The black/silver jacket fit well and the blue jacket was very slightly snug, but not terrible. I ended up keeping the blue jacket in size small, figuring it has plenty of stretch. So yes, I would highly recommend this coat if you find regular jackets uncomfortable in the summer. I will anxiously await FITS making other styles of this jacket, as I'd like to have another so that I'm not wearing this coat every day this summer.